Today is a very special day. Why, you ask? Well, it’s because today marks the end of settling into our new house! After several weeks of searching, negotiating, and nesting, we are finally settled into what will be our home for the next year, and the potential home for future generations of MPI Guatemala’s Program Directors. The house is beautiful and already feels like home. Located at the entrance to Sololá, it has three stories, classy red tile floors, white stucco-ish walls, and rich wood ceilings. Personally, my favorite aspect of the house is the view. From our balcony on the 3rd floor, we overlook our neighbors’ courtyard and corn fields, and we can see the plaza in Sololá. 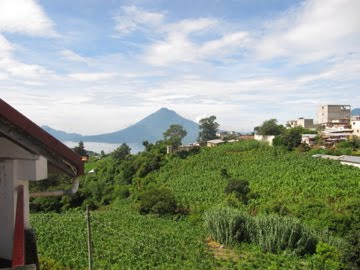 Plus, every room (minus the bathrooms) boasts an incredible view of Lake Atitlán and its three surrounding volcanoes. Truly, I feel as though we are living in a postcard photo. What an amazing opportunity to be able to live and work every day in a location so breathtaking! Another view from our balcony into the heart of Solola. You can also see the feria streamers! Before the other PD’s and I arrived in Guatemala, our two fearless Country Directors Kat and Dana had scoped the area around Chaquijyá for houses and had found two potential options. However, during our stay in San Pedro, we were aggrieved to learn that not only would the construction on one house not be completed in time for our arrival, but also the second option would not be as feasible as we had originally expected. Consequently, the team and I quickly had to devise alternate plans to find a home. In most of Guatemala, most house hunters do not use real estate agents, but instead learn of available homes through their friends and extended families. While we did not have a large social network in place in Sololá, we decided to see if this same system would also work for us. Thus, following a brilliant idea from Kat, we travelled to Sololá after our morning classes, and divided into groups to post flyers around the city advertising our needs. While posting the flyers, we also met several residents of Sololá and asked them if they knew of any houses for rent. As you can guess, the plan was successful! With the help of our flyers and the friendly residents of Sololá, we found four great potential houses during that first afternoon, and now have our beautiful (and feasible) home! Although we encountered some difficulties in installing our stove, water deposit, and washing machine, those obstacles have been tackled and I know we are all so happy with the furnishings and layout of the house. I guess our process is testament to the old phrase: “If at first you don’t succeed, try, try again.” Having overcome our first set of challenges, we begin work in the community with our bags unpacked and our heads held high. We bought so much from our new friend Trinidad that he threw in a free toaster! Throughout our house hunting adventure, the group and I were also fortunate to receive visits from two of the founding Program Directors for MPI Ecuador. Currently a Spanish teacher in Oakland, California and all-around baller, Craig Smith visited and stayed with us in San Pedro for a week. Besides joining us on our sunrise hike up the Indian’s Nose and many social activities, Craig also greatly helped us as we negotiated with landlords and met to choose the best of the four housing options. 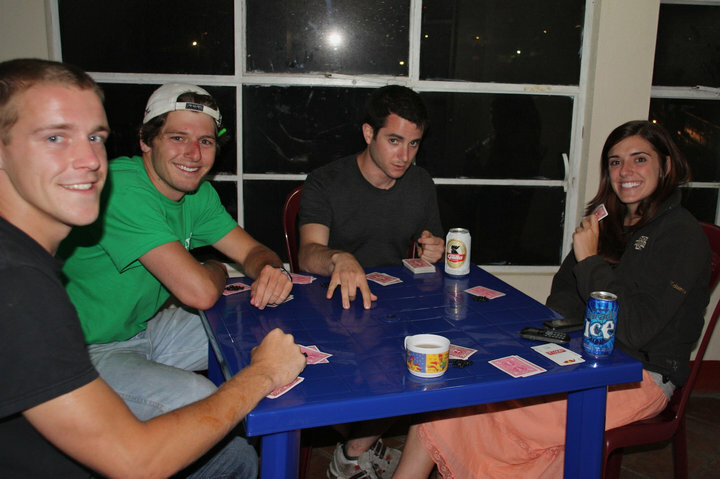 Two weeks later, a current MPI Board Member, Zak Schwarzman joined us to celebrate moving in to the new house. Together with his hysterical girlfriend Briget, Zak took us down in several rounds of the Ecuadorian card game Cuarenta, but we've been practicing and are ready for a rematch. Overall, our time with Zak, Craig, and Bridget was fun and beneficial for our group. Not only did they share some great stories from their experiences in Ecuador, but they also imparted useful and thought-provoking advice, and gave our group a clearer picture of the mission of Manna Project as an organization. Cuarenta with Zak in our living room... before it was furnished. Recently, after meeting Zak and Craig, it occurred to me that everyone I have met from MPI, every board member, every Country Director, and all the past and current Program Directors have amazed me with their intelligence, dedication, and overall spunky personalities. I feel so incredibly lucky to be part of an organization filled with such amazing individuals. I know that by working together with MPI past, present, and future, we can make a difference; and I cannot wait to see how the year progresses for all three sites and for Manna Project as a whole. AMAZING. Love the new house. Love the new furnishings. Wow, the house looks awesome! Great job guys! Yeah no kidding, that living room looks twice as big as the last time I saw it! Just gonna go out on a limb here and guess that the window treatments were not Hudson's handiwork. Great seeing you guys, thanks for being incredible hosts! The house looks incredible guys, I can't wait to come back and see the finished product in person!! We had such an awesome time hanging out with you guys - ya'll make a great team! BTW, we picked up a new game in San Pedro - ready to put up your Q's Hudson? ?